We've written about him many times before but I make no apology for waxing lyrical again about Harold Burson – he is a PR legend. This week I was lucky enough to attend a party in New York City to celebrate Harold's 90th birthday, which was attended by Burson alum from around the world and many current executives in town for a global company conference. The affection for Harold in the room was palpable as people waited in line to congratulate him. Luminaries attending included Alcoa's Nick Ashooh, reality TV star and People's Revolution founder Kelly Cutrone, Council of PR Firms chair Kathy Cripps, the reputation doctor himself, Mike Paul, and many, many others. Francisco Carvalho, managing director of Burson-Marsteller in Brazil, presented Harold with a Brazil soccer shirt with his name on the back that Harold proudly donned before stepping up to make a funny and moving speech. 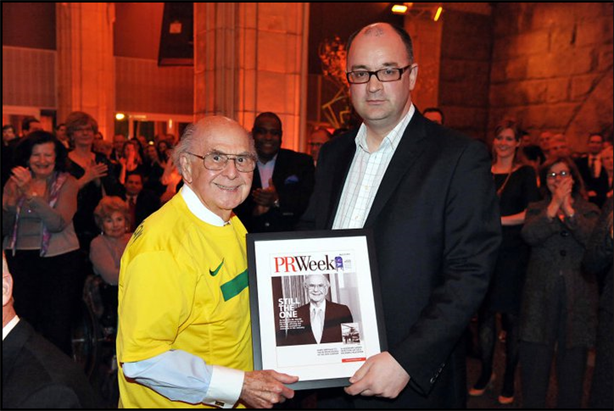 And PRWeek presented Harold with a commemorative cover alluding to the fact he was named our PR person of the 20th century. Harold still goes into the office most days and still works with clients, so at this rate he's putting down a pretty good marker to be the PR person of the 21st century as well. The best tribute to Harold is the culture he created at the agency he founded back in 1946, subsequently merged with Marsteller in 1953 to create Burson-Marsteller, and built into the largest PR agency in the world. Burson alum groups exist all around the world and still meet up regularly. Reference was made to the handwritten notes Harold would send individuals when they had done something well, many of which have been kept as treasured mementoes. I particularly enjoyed catching up with former Burson veterans Bob Leaf, Al Tortorella, Joe Benway, and Dominic Di Frisco, who regaled me and the rest of the PRWeek crew with some fantastic tales of PR derring-do straight out of the era of Mad Men. Harold is a tough act to follow and there were years after his departure from a full-time executive role when the now WPP-owned firm lost its way. But his legacy remains strong as the Burson-Marsteller of the present, led by Mark Penn, looks to build on the encouraging progress it has made in recent years and establish its own identity.